JUL 1968 - JUN 1969 Running aground on a beach in North Vietnam nearly. Bream (SS-243) was launched 17 October 1943 by Electric Boat Co. Groton Conn.; sponsored by Mrs. Wreford G. Chapple wife of the prospective commanding officer; and commissioned 24 January 1944 Commander Chapple in command. Bream's war operations extend from 1 June 1944 to 15 June 1945. During this period she completed six war patrols operating in the Java Celebes Sulu and South China Seas and the Gulf of Siam. She sank two Japanese vessels totaling 6934 tons. In addition Bream shared with Ray (SS-271) and Guitarro (SS-363) the destruction of a 6806-ton passenger-cargo vessel. On 23 October 1944 while patrolling off western Luzon Bream made a daring surface attack on a Japanese formation damaging the heavy cruiser Aoba. Bream got underway from Saipan for Pearl Harbor 6 June 1945 enroute to the United States for navy yard overhaul. She arrived at San Francisco 24 June 1945 and underwent overhaul and was placed out of commission in reserve 31 January 1946. Bream was recommissioned 5 June 1951 and reported to Submarine Squadron 3 Pacific Fleet. From June 1951 to August 1952 Bream engaged in type training and services to the Fleet Sonar School San Diego. On 10 September 1952 she went out of commission in reserve at San Francisco. Bream was converted to a killer submarine and reclassified SSK-243 18 February 1953. 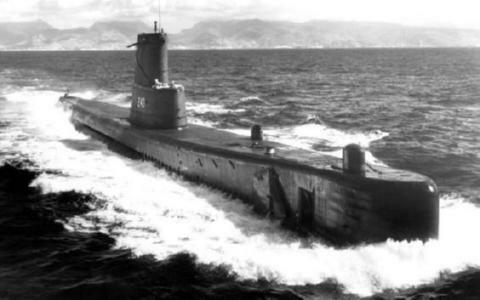 Following recommissioning 20 June 1953 Bream participated in all phases of peacetime submarine operations in the Pacific Ocean. She conducted an Alaskan training cruise in September 1954 returning to San Diego 5 November 1954 via Pearl Harbor. Bream carried out operations off California until she made another trip to Pearl Harbor during 7-24 May 1955. Her next departure from the west coast was on 6 March 1956 for a cruise in the Western Pacific which terminated at San Francisco in early 1957. Bream was awarded four battle stars for her World War II service.